The Hayloft is a superb barn conversion set in a delightful South Devon hamlet situated between Salcombe and Kingsbridge. With good sized gardens and grounds and glorious country views you really feel like you’re in the heart of the countryside. This immaculate property features a stunning new kitchen and new bathrooms, together with a new point of access to the garden direct from the kitchen/dining area. With four bedrooms and two bathrooms on the ground floor, the first floor has a wonderful open plan living/dining/kitchen space which enjoys the beautiful views across the surrounding farmland to the south and the west. There is also a very useful newly fitted utility and shower room. Outside there are lovely gardens, and a south and west facing patio together with dedicated parking. 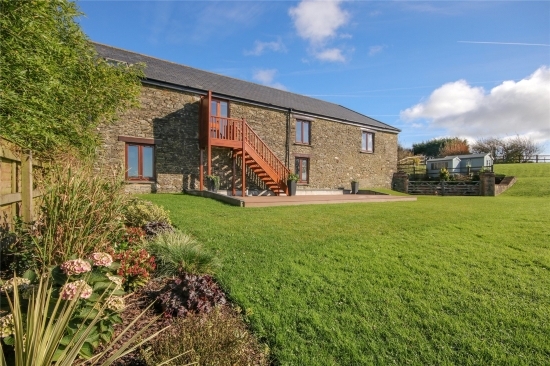 The Hayloft is offered to the market with a guide price of £575,000. For further information please contact Marchand Petit’s Kingsbridge office on 01548 855593.